It was an 18th sectional title and fourth in a row for East Central in 2018. The program is enjoying its most prosperous run in school history. Expect the Trojans to continue to thrive even though they will be playing for a new head coach. Former alum and quarterback Jake Meiners takes over the reins as head coach. The 28-year old has been an assistant at East Central for the last five years. He is a favorite of the players and it should be a seamless transition with him running the show on the sidelines. Meiners inherits a defense that is loaded with veteran experience. The Trojans allowed less than 250 yards of total offense per game last fall. The offense has a couple question marks including one under center. East Central has won 18 playoff games (with just three losses) over the last four seasons. It wouldn’t surprise anyone if the Trojans end up in the state championship for the third time in the last five campaigns. The talent is there to get that accomplished. Devon Donawerth, Sr, SS – A two-time Class 4A All-EIAC selection, Donawerth is a difference maker in the secondary and in the return game. He heads into his senior year with 984 total return yards, four punt returns for touchdowns, 95 total tackles and eight takeaways (three FRs, five INTs) in his career. 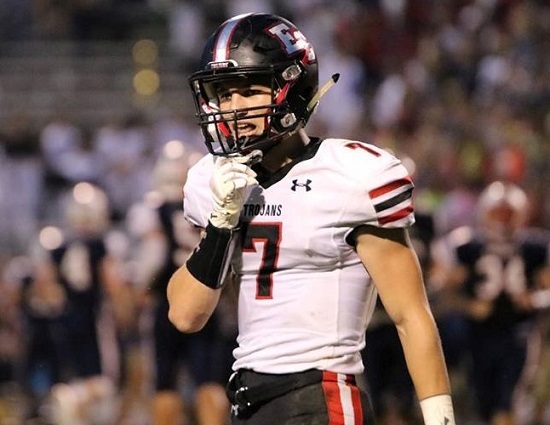 Chase Ludwig, Sr, DB – Ludwig earned Class 4A All-EIAC honors after tallying 48 total tackles, 3.5 tackles for losses and three interceptions as a junior. Trevor Becker, Sr, WR/QB – A Class 4A All-EIAC honoree after catching 21 balls for 368 yards and four touchdowns as a junior. Becker will be in the mix for the starting quarterback job this fall. Luke Collinsworth, Jr, OT/TE – The 6-foot-6, 275-pound Collinsworth is one of the area’s premier offensive lineman. He was a Class 4A All-EIAC selection as a sophomore. Collinsworth also caught five passes for 47 yards and a touchdown. He has offers from Indiana and Cincinnati. Gage Ertel, Sr, DL – Named Class 4A All-EIAC after getting in on 40 total tackles with one-and-a-half sacks and an interception as a junior. Kyle Krummen, Sr, DL – If it is a big game you can bet Krummen will shine. The senior is coming of a year in which he tallied 74 total tackles, 21.5 tackles for losses with 11.0 sacks and three forced fumbles. Nate Griffin, Jr, LB – A starter since his freshman year, Griffin is on his way to becoming one of the most productive defensive players to ever lace ‘em up for the Trojans. He has 80 total tackles, 3.0 sacks and eight takeaways (two FRs, six INTs) in his career. Kole Viel, Jr, LB – An outstanding varsity debut saw Viel record 63 total tackles, record a sack, a forced fumble and two interceptions in ‘18. Jake Fike, Jr, RB – Should have a monster year as the Trojans featured back. Fike ran for 496 yards and eight touchdowns as a sophomore. He also had two receptions for 53 yards and a score. Troy Teepe, Sr, TE – Will move to tight end after being a fullback the past two seasons. Injuries limited Teepe to 132 yards on the ground, two receptions for 26 yards with two rushing touchdowns in just six games as a junior. David Badescu, Sr, WR – If Becker moves to quarterback Badescu will become the Trojans first option at receiver. He had 18 receptions for 219 yards and a touchdown a year ago. Noah Wheat, Sr, LB – A healthy Wheat will make an impact for East Central at linebacker. Devin Salyers, Sr, OL – A beast on the Trojans o-line, Salyears has worked hard to make himself an all-conference caliber performer. Cody Bentley, Sr, OT – At 6-foot-2 and 290-pounds Bentley is an immovable force up front who gives opposing defenses all they can handle. Nick Griffin, Sr, FB – The senior will play a prominent role as a blocker for the Trojans rushing attack. Erik Perkins, Jr, slot/DB – Perkins provides valuable depth and receiver and in the secondary. Andrew Struewing, Sr, DB – Not the biggest defensive back but pound-for-pound there aren’t many better in coverage. Sophomore Ryan Bond and junior AJ Messmore will compete for the starting quarterback job along with Becker. Keep an eye on Hunter Sohns who ran for 85 yards and a touchdown in four games as a freshman. Classmates OL Logan Adams and TE Casey McQueen have a very good shot at being part of the Trojans offensive rotation. Messmore could also see time as a defensive back along with sophomores Derek Richter and Anthony Littleton. A stout group of linebackers becomes even deeper with the addition of junior JD Poindexter. Over the past five seasons East Central has had seven winning streaks of five games or more including last year’s run of 10 consecutive victories. The Trojans return six players who have combined for 18 interceptions in their careers: Nate Griffin (six), Donawerth (five), Ludwig (three), Viel (two), Ertel and Perkins (one). Last fall Alex Maxwell (1,244) and Eric Rosemeyer (1,665) fell 91 yards short of becoming the fourth straight pair of East Central players to combine to run for more than 3,000 yards ina season. Luke Patton (1,712) and RB Doug Rosemeyer (1,442) accrued 3,156 yards for the state runner-up club in ’15. Then Maxwell and Logan Storie topped the mark for two years in a row. They amassed 3,134 yards on the ground (Maxwell – 1,302; Storie – 1,832) in ’16 and 3,022 yards rushing (Maxwell – 1,075; Storie – 1,947) in ‘17.